Duplicate virtual machines (VMs) may appear in the SCVMM Administrator Console window after a Hyper-V VM in a cluster fails over to another cluster node. Additionally, the status for one of the duplicate VMs is set to Missing. If you try to remove the missing VM from the SCVMM Administrator Console window, the VM is not removed. You install the Hyper-V role on a computer that is running Windows Server 2008 R2. You configure the computer to start from a virtual hard disk. The computer is part of a Hyper-V failover cluster. The cluster is configured to use cluster shared volumes. 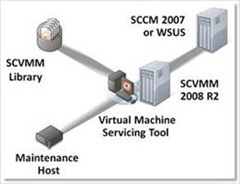 You try to create a VM on a cluster shared volume by using SCVMM 2008 R2. In this scenario, the operation fails together with the 2912 (0x8004232C) error code. System Center Operations Manager 2007 integration is enabled. A Performance and Resource Optimization (PRO) feature-enabled management pack is imported into Operations Manager. The PRO settings for a host group are changed on the SCVMM server. When setting up VMs with dynamic memory remember that your hyper-v host may stop if those VMs consume (or try to) use all existing memory on the host leaving nothing for the parent partition. Setting = amount of MB to reserve for the parent partition. After setting up the desired value you must reboot the host to the setting become active. Note: if you set this value too low; VMs will be able to use too much memory and cause performance issues for you. Equally – the higher you set this the fewer VMs you can run. You may see the following error when trying to remove a “dead” host from your SCVMM console. Access has been denied while contacting the server <servername>. 1. Verify that the specified user account has administrative privileges on <servername>. 2. Verify that DCOM access, launch, and activation permissions are enabled on <servername> for the Administrators group. Use dcomcnfg.exe to modify permissions, and then try the operation again. Wait a few seconds and the host should be removed from the console.